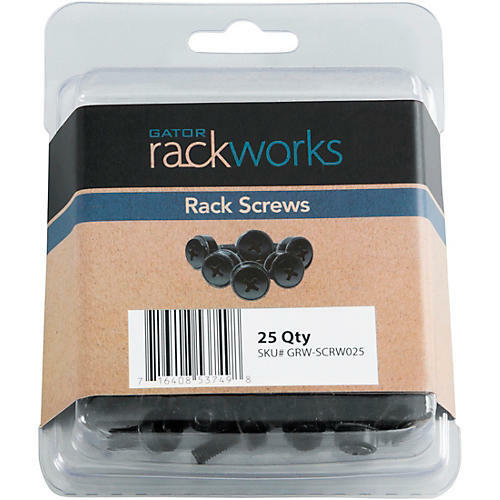 This pack of standard-size rack screws will keep your racks in business, whether you’re adding new equipment or just want to replace older, worn rack screws. Long known and respected for its high-quality workmanship, Gator Cases cut no corners in designing and manufacturing these pro-grade screws. You’ll appreciate the precision engineering, the durable, corrosion-resistant, black exterior finish and tough-as-nails stainless steel. Each Gator Cases rack screw includes an equally robust washer to keep things in place and spread the screw’s pressure evenly over the surface. Each screw is 10/32 x 3/4 in. size. Size 10/32 x 3/4 in.